Catholic Bishops Have The SCOTUS Sadz - Joe.My.God. “It’s hard to imagine how the essential meaning of marriage as between the two sexes, understood in our nation for over two hundred years, and consistent with every society throughout all of human history, could be declared illegal. To those arguing for a constitutional redefinition of marriage, one must ask: when did the Constitution suddenly mandate a novel and unfounded definition of marriage? To ask such a question is not a judgment on anyone. It is a matter of justice and truth. The central issue at stake is: what is marriage? The answer is: a bond which unites a man and a woman to each other and to any children who come from their union. Only a man and a woman can unite their bodies in a way that creates a new human being. 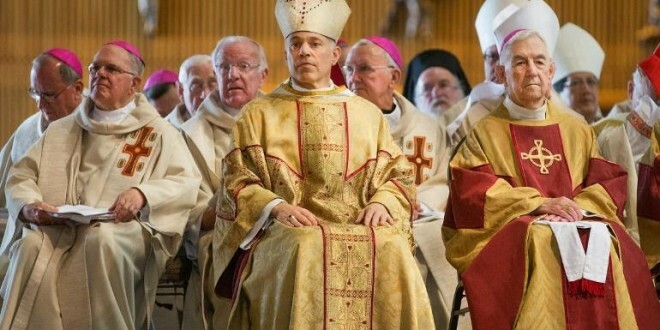 Marriage is thus a unique and beautiful reality which a society respects to its benefit or ignores to its peril.” – “Father of Prop 8” and drunk driver Archbishop Salvatore Cordileone, in a press release issued on behalf of the United States Conference of Catholic Bishops.